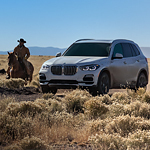 The 2019 BMW X5 SAV is a sporty and technology-rich sports activity vehicle. This line of vehicles includes several trims that provide a wide variety of desirable technology options. These options include driver vision enhancement systems as well as vehicle attitude warning alerts. The 2019 BMW X5 SAV trims include optional night vision service for drivers. This specialized technology can enhance headlight illumination and provide drivers with extended levels of awareness. The auto leveling headlights back up this system by providing drivers with yet more autonomy. The 2019 BMW X5 trims also help drivers to keep tabs on the attitude of the vehicle. Proprietary technologies such as the Lane Departure Warning service as well as the Lane Keeping Assist system can both warn drivers of unwanted vehicular motion and return cars to their proper paths of travel. Plus, the Cross Traffic Alert system gives drivers warnings during hazardous intersection interactions.